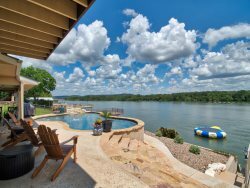 Front Desk Vacation Rentals offers the best collection of waterfront properties on Lake LBJ. We are family owned and operated company based out of Marble Falls, TX and personally oversee all of our properties. Cool Waters Lake LBJ Cabin Rental - New Updates for 2019! Bonnie Brae - Excellent Wake Boarding Location On The Colorado Arm! Many Updates, WiFi, NEW BOAT DOCK COMING SOON! The Oak House - Lake LBJ'S Best Kept Secret! Pecan House | Amazing New Rental Located on Pristine Waterfront!